I do a lot of my own work around the house: Repairs, simple remodeling. It saves me money and I really enjoy the work. The one thing that gets me down, though, are stripped and damaged screws. Getting those things out can be seriously difficult. I struggled with them for a long time, until a friend told me about SpeedOut. I wasn’t sure what to think, but the website offered a money back guarantee, so I figured I’d give Speed Out a try. I was amazed at how well it worked! SpeedOut is actually a complete set of attachments for your power drill. Choose the appropriate size for the screw or bolt that you are trying to remove and put on some eye protection. 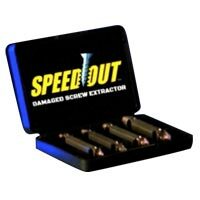 SpeedOut drills into the screw and then you reverse the attachment and extract the screw or bolt. Simple, quick and straightforward. SpeedOut requires a power drill to work, so you’ll need to make sure that you have one. I bought my SpeedOut online, via the official website. I got a money back guarantee and a free light bulb extractor . . . I just had to pay extra shipping. I was also able to get a discount on other SpeedOuts, which was great for gift giving. If you have a power drill, you need to get SpeedOut. After all, you never know when you are going to have to deal with a broken, stripped or painted-over screw or bolt. Get one now and you won’t end up panicking later on when your DIY project goes sour.